“We may encounter many defeats, but we must not be defeated.” (Maya Angelou), as seen on the Jack’s Winning Words blog. There has been much written and said about poet Maya Angelou since her recent death. One of the legacies that she left was a strong message to women about their ability to overcome adversity in life and find the strength to succeed. Much has been written about the adversities that Maya overcame to rise to the level of internationally celebrated author, poet and actress. I suspect that there was a lot of that advice hidden in Ms. Angelou’s quote. She refused to be defeated and kept on trying. She kept getting back up whenever life knocked her down and as she also is quoted as saying, she held her head high and walked tall. She appears not to have measured her success in life in monetary terms or by the number of important people that she knew, but, rather by the level of self-confidence and dignity that she was able to maintain. She was very comfortable with herself and I’ve written about that, too. I haven’t posted for a few days, not because I had nothing to say, but because I wanted to let my post about Memorial Day stand for a while. That said, it’s time to move on and find inspiration for our daily lives and what better source that the ultimate cool dude of our modern times – the Dalai Lama. We certainly all meet tragedies in our lives. Some we just remembered as we honored the fallen who served our country. In other cases it might be the death of a beloved parent or sibling or spouse. Sometimes it doesn’t involve death, but just really bad news or events (think fires and tornadoes). Whatever the tragedy, we must not let it pull us down into hopelessness and despair. In searching for that inner strength many turn to their religious beliefs. There is probably no more positive and uplifting message for any occasion than that which can be found in the Bible. Religion, after all, is man’s answer to the things befalls us in this life that we cannot understand or control. I’ve written several times about dealing with things that happen in life both big and small, so wander back through a few of those posts. A common theme is that the big scary things, sad or hurtful as they may be, don’t kill you and you must find a way to go on and that way is already within you – it is your inner strength. It is that thing that pulls you through when you think that you can’t go on. The Dali Lama calls it your inner strength. A pastor might call it the peace that passes all understanding. Some might call it guts. Whatever you call it, you must call upon it to get you through those tough times. You’re still here. You’re still standing. You will go on. Don’t hang your head and look at your shoes; how it up and see the future. There are many stories that come out every Memorial Day about those left behind in the wake of the tragedies of wars – the widows and children. There are also always stories of the great things that many of those widows and single moms accomplish after those tragedies. These are the women who found their inner strength and who not only met the challenge but went on to excel often establishing service organizations to help others going through tragedies of their own. They did not fall into despair, but, rather rallied into action. …pain is inevitable; suffering is optional. To avoid suffering,find your inner strength. 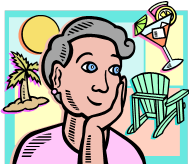 It’s Memorial Day Weekend; a time that younger people may see as a nice long weekend start to the summer season. It’s much more than that, of course; it is a time to pause, reflect and say thank you to the men and women who have served and are serving in our nation’s Armed Forces. We especially take time to remember those who sacrificed their lives in service to out country. 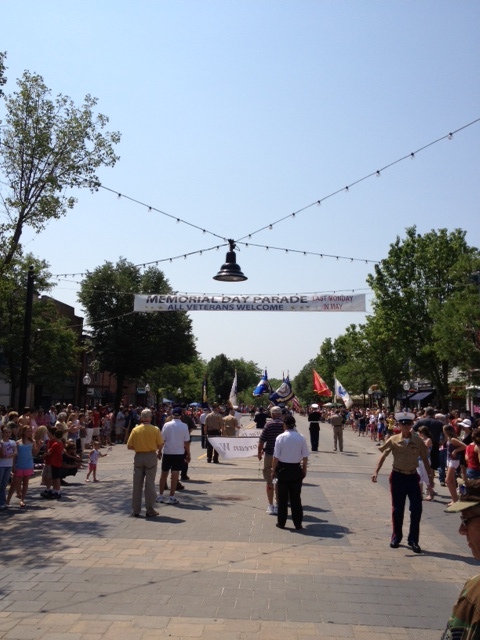 On Memorial Day there will be the traditional parade of veterans in Milford, Michigan, along with all of the hoopla that goes along with a modern parade – marching bands from the local schools, Military vehicles of all types, scout troops and more. And then there are the veterans – hundreds of men and women from wars stretching back to WWII and forward to the actions in Afghanistan and Iraq of today, and covering all of the time in between. Thousands of people line the streets of Milford, standing and applauding continuously as the groups marches by 2-abreast. As a marcher for the last few years, I can tell you that it is a great feeling to experience this outpouring of appreciation; especially so for us who march in the View Nam Veterans contingent. We had no such welcoming parades back then. welcome to join the march. For those who cannot walk the parade route there are volunteer Jeeps for transport along the parade route. 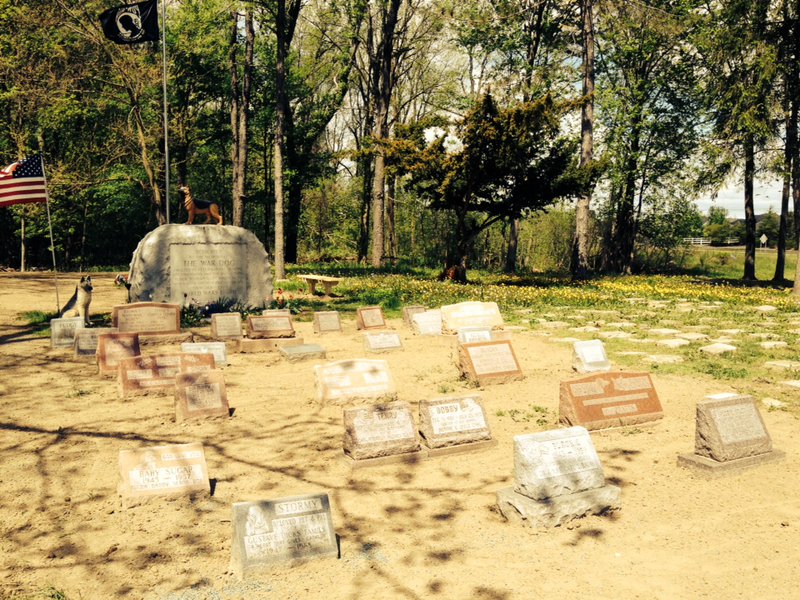 There is another experience that I encourage you to have, if you have the time over the weekend – visit the Pet Cemetery in South Lyon/Lyon Township at Milford Rd and 11 mile Road and pause to see the War Dog Memorial. This cemetery has been in existence since the 1930’s but only in the last few years has it been reclaimed from the terrible condition that it was in and a monument to the K-9 heroes of several wars was enhanced. There are dogs buried in this cemetery that were in service as far back as WWII. There are literally hundreds of pet buried in this location, both dogs and cats. There are also many dogs that served overseas in our wars buried in the cemetery, including its newest hero Sgt. 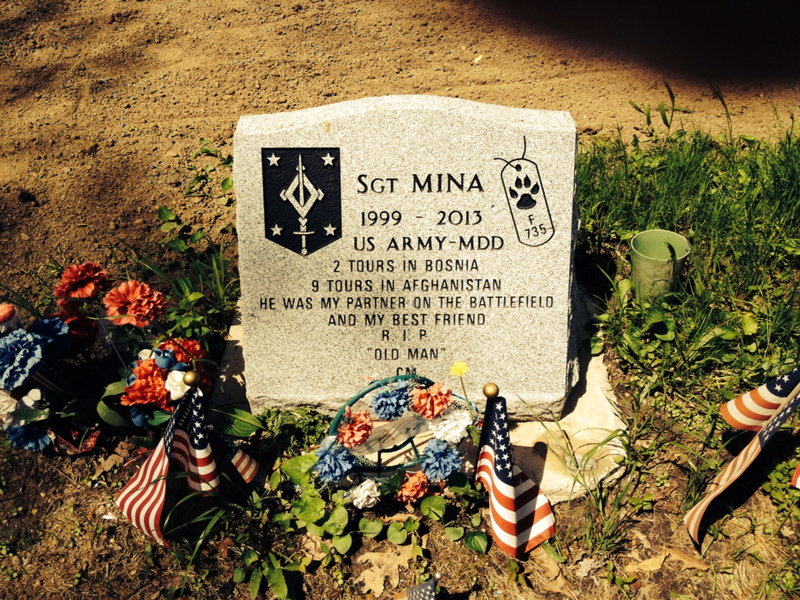 Mina, a veteran of 9 tours in Afghanistan and 2 in Bosnia. You can read Mina’s story by clicking here. 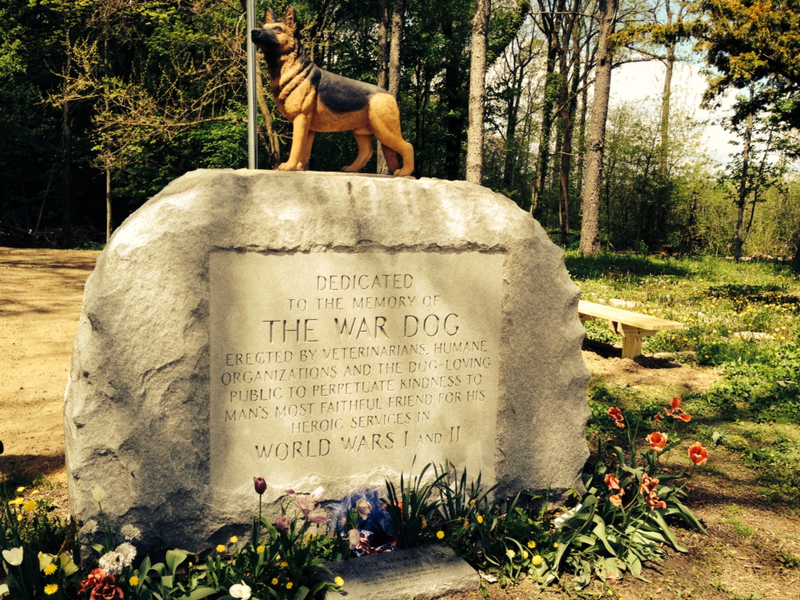 You can read the back story on this wonderful facility and the rescue effort that is still under way to reclaim this final pet resting ground from nature at their web site – Michigan War Dog Memorial. It had fallen on hard times and been forgotten for years when the current rescue group found it and started work in 2010. They have succeeded in cutting back enough of the overgrowth and cleaning up the area that you can now get an idea of the size of this place, which houses hundreds of pet graves. They’ve also added benches so that people can sit and contemplate these largely unsung heroes of our past wars. It’s really a pretty awesome place and one that cannot help but bring back memories of some loved pet from long ago, or maybe a service dog, police dog or military dog that you knew. To watch a YouTube video about the cemetery and the reclamation effort, click here. Go to their Web site if you’d like to help with a contribution or volunteer to help with the continuing reclamation work on this unique cemetery. It’s oh so easy to fall into a pattern of just going through life. One can easily fall into routines and find a comfort zone that required little growth mentally and emotionally. I believe that this leads to people getting prematurely “old”. They may not be old in years, but they’ve become stagnant and old in their outlook on life and they act like it. Their answer to “How’s it going?” is always, “Same ole, same, ole.” They become boring to know and to be around, because they never try new things. Even worse is that, left unchecked or unchallenged, this behavior becomes a self-reinforcing spiral into old age and withering away. Avoid that fate by committing to grow through life. Do you know people like that? Are you becoming a person like that? Maybe yo already are a person like that. How do you escape this trap? The key it is be committed to growing throughout your life, not just going through life. That continuous growth can take many forms. One of the easiest is to remain committed to learning new things. That doesn’t have to mean taking classes in a school all of the time; it can be as simple as committing to reading books and magazines and newspapers and Internet Blogs to keep up with what is happening around you. What is happening around the world right now? What is happening in the U.S. that might affect you? How about in your state or your town; what’s happening locally? Now that you know about more of these things, what are you doing about it? Once you commit to continued learning you are committed to grow through life. Growing also means doing. People who are doing more than just mailing it in with their lives are usually busy people. They are out volunteering at church or with community groups. These are the people who make things happen, who run the local events in your community. They collect food and raise funds. They serve the homeless and protect the weak and abused. They build houses on the weekends. They tutor and mentor at-risk kids.These are the people that you wonder how they can do it all; all the while they are wonder how you can see the same needs and not do something. They aren’t just out there working; they have committed to grow through life. A wonderful and reinforcing side-effect of all of the education efforts and work and service that these people do is that it brings them in contact with so many others who are also committed to growing. They meet a diverse cross-section of life and have experiences that broaden their perspective on things. They begin to understand other cultures and races better through a shared commitment to serving others. They grow emotionally and intellectually because of those experiences. They do not settle into a dull routine; they just don’t have time for that. Ask them and they’ll tell you that they can’t imagine not doing what they are doing, because they have committed to grow through life. So, you have a choice. Do you settle in where you are in life and stop learning or participating in the community activities that are around you; or, do you grab a new chuck of life every day, every week, every month and never stop learning, never stop moving, never stop helping. When you are gone will people really miss you because they knew that you’d always be there to help; or, will they hardly miss you, because they couldn’t remember that you were still alive. You will always be alive in people’s minds when you commit not to just go through life, but to grow through life. 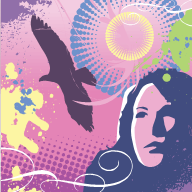 “Dreams are the mirages of hope” – as seen in the Graffiti comic strip. When I saw that on the comics page of the paper, I thought “how profound”; then I looked up the term mirage and thought some more about it. Dreams may be mental mirages – mere illusions that our sub-conscience plays out in our unguarded moments of sleep. However, dreams can also be a fantasy achievement of our hopes; and as such they are not so much an illusion, but may be a road map concocted in our imagination to show us how to achieving those hopes. Dreams allow the constraints that we place upon ourselves to drop away. Fears that hold us back while we are awake can magically disappear in our dreams. The term “mirage” is actually a well understood naturally occurring phenomenon that involves seeing things in the distance that aren’t really in the places that they appear. It is in most cases and optical illusion, but the key thing is that it does involve real objects somewhere. A dream based upon hope is sort of like that, too. It is not all just made up; it involves real goals and aspirations that you have and hope to achieve. So perhaps dreams, like mirages, allow us a closer view of a distant object (or hope). If so, that’s not a bad thing. Do you have dreams based upon your hopes? Do they help keep those hopes alive? If so, they’ve served a good purpose. We are all occasionally prisoners of pre-conceived notions (sometimes mistakenly called knowledge) – things that have found their way into our minds from somewhere and stuck there. In extreme cases, when applied to people, these “truths” result in bigotry. When applied to our view of the world and what we might accomplish, sometimes the limits that we place on ourselves, because we believe that we can’t do something, are the only things holding us back. Do you find that you have immediate reactions to things or people that leap out of your mind when you encounter them? Why? What or who put those notions there? When was the last time that you re-examined them to see if they are really true or just fears or prejudices? Perhaps it would be time well spent to ponder on occasion why you don’t do certain things, go to certain places or associate with certain types of people. What are you missing out on because of those things in your mind that hold you back from those experiences? Is it time to try to change your mind? One of the greatest sources of fear in or lives is a lack of knowledge. We sometimes fear what we don’t understand or can’t find a way to relate to something that we already know. We fear or are repulsed by a person who dresses strangely (at least by our standards) or who has a hair style or color that we find somehow odd. This is a particularly strong reaction when dealing with cross-cultural norms. Things that are quite normal in one culture may be totally alien or even offensive in another culture. For instance, the Western-culture habit of men slathering on after shaves or body scent is considered quite offensive in many Middle-Eastern cultures, where such scents are reserved for females. I think the secret to changing your mind is to first open it to the possibility of change. One must first admit that everything rattling around in our heads is not necessarily true or of value, just because it is there. Many things probably got there before we were old enough and wise enough to add any thought to whether it was true. 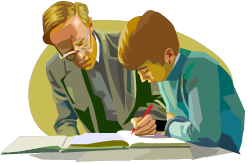 Psychologists and psychiatrists are always pointing back to the things that we learned as children and a source of today’s prejudices, fears, psychoses and other issues. So, every now and then, like cleaning out a dusty attic, we need to open our minds and toss out some of that “knowledge” that has been limiting us all of our lives. 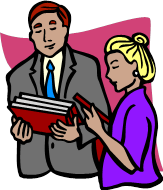 What old knowledge do you need to toss out or re-examine in order to allow yourself to grow? Open your mind and allow the fresh air of change in today. You’ll be a better person for it. 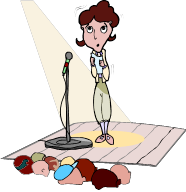 Every so often on TV shows mainly you will hear the phrase, “My life is over!” This line is usually delivered by some actress playing a drama queen teen ager who has just been turned down by the boy of her dreams for a date or some such event in her life. While today’s three little words may seem very shallow on the surface, they do nicely sum up what Frost and others have been trying to tell us forever. No matter how dire the consequences that you imagination can dream up and no matter how devastating the loss you have suffered- life goes on. It turns out that we usually wake up the next day and the world is still there. Sure, there may be a very big or painful void in the world as you knew it; but it is still there, the rest of the people are still there, the rest of your life is still there in front of you. There are people for whom life seemingly stops, at least temporarily; as they get stuck in their reaction to an event and have trouble getting past it and going on with their life. Grief and regret are powerful things that can seemingly grind life to a halt; but in the end life goes on. 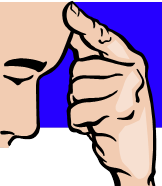 Perhaps you have a particularly unpleasant task to do today or issue to face today (maybe with a friend or co-worker). Maybe you’ve spent the weekend worrying about this day and imagining all of the worst things that could happen. Well, it’s here and something will happen and maybe you’ll need an extra glass of wine tonight to relax and recover from the day’s events; but, you’ll still be here at the end of the day and tomorrow and all of the tomorrows after that, because life goes on. So, no matter how big the spiders are that your imagination has conjured up for you to face today; there will be a tomorrow and you will still be there. Life goes on and you must too. Stay Calm and Carry On. You are currently browsing the NormsMilfordBlog blog archives for May, 2014.